It seems to us that, in these modern times, most people would like more and simpler storage where they work and live. Whether you have a family or live alone, have a large or small living space, there is just never enough space to put away your stuff. There's also the annoying problem of wires for charging our growing number of electronics. Wouldn't it be better if they could all be hidden, but at the same time perfectly accessible? This was our motivation for creating the Ull & Eik Sofa. ’Ull & Eik', which directly translates to ‘Wool and Oak’, is a combined sofa and cabinetry system. The base unit is an 80 cm X 80 cm (31,5” X 31,5”) drawer which can be fitted with a table or sofa seat in variety of configurations. 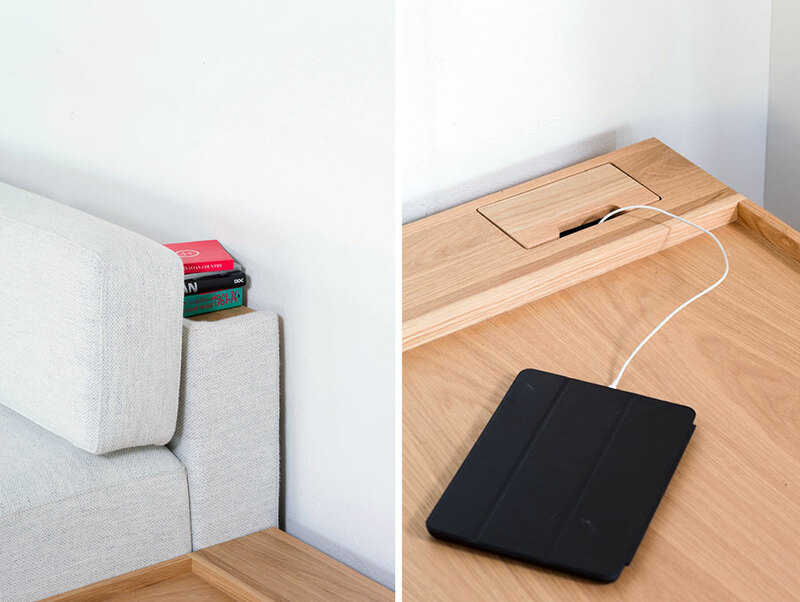 Once an arrangement is fitted to your space, it can be accessorised with a shelf and integrated outlet in the back. This is a 'made to order' product so please contact us regarding pricing information and configuration possibilities. The drawer fronts, shelves and tables are made of solid oak, the standard fabric is a wool blend from Gudbrandstalens, the seat is filled with a special sandwich of foams which provides maximum comfort while occupying minimum space.